Photograph depicts men on power house scaffolding, mountains in background. Corresponding note on accompanying photo description page: "Pictures taken July 2nd, 1952. 2. Power House. Looking West." Corresponding note on accompanying photo description page: "Pictures taken July 3rd, 1952. 4. Putting on roof of Power House in foreground. Temporary Camp & Service garage in background. Taken from top of water tower and looking east." Photograph depicts small building built into dirt landscape, mountains in background. Corresponding note on accompanying photo description page: "Pictures taken July 5th, 1952. 8. Root House. Looking north." Photograph depicts building materials in framework room. Corresponding note on accompanying photo description page: "Pictures taken July 5th, 1952. 10. Mill. Second floor. Looking south." 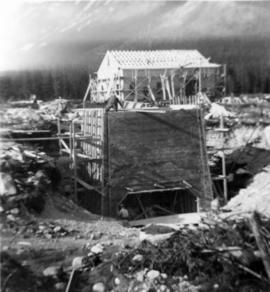 Photograph depicts power house under construction. Temporary camp, service garage, and mountains in background. It is believed that this photograph was taken from top of the plant water tower. Photograph depicts interior framework of building under construction, speculated to be mill building. Photograph depicts two men on upper floor of building under construction, speculated to be mill building. 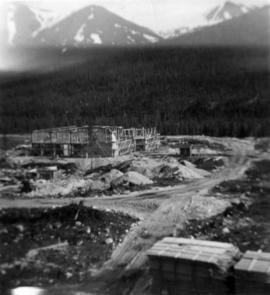 Photograph depicts mill building under construction, mountains in background. Photograph is speculated to be taken from top of water tower. Corresponding note on accompanying photo description page: "Pictures taken June 11th: (5) Drilling big boulders in truck dump excavation. Looking north." 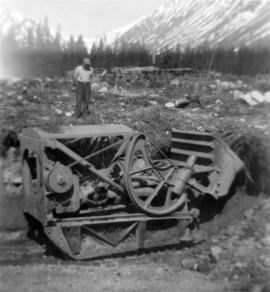 Photograph depicts mill framework in distance, mountains in background. 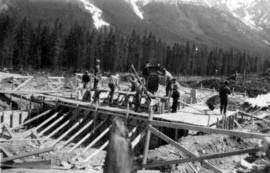 Corresponding note on accompanying photo description page: "Pictures taken June 28th, 1952: (6) Mill construction. Looking west." 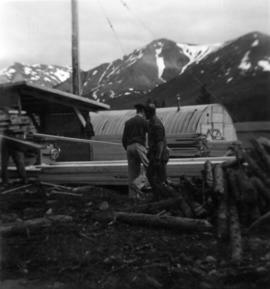 Photograph depicts men working on plant site, mountains in background. 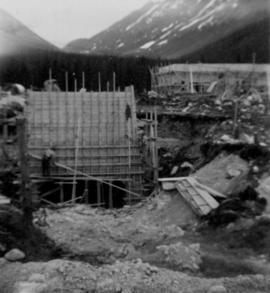 Corresponding note on accompanying photo description page: "Pictures taken June 28th, 1952: (7) Power house construction. Oil tanks in background. Looking west." Photograph depicts men on plant site. Corresponding note on accompanying photo description page: "Pictures taken June 28th, 1952: (9) Truck dump with concrete poured in foreground. Power house in background. Looking north from mill." Photograph depicts foundations and framework from interior of building. Corresponding note on accompanying photo description page: "Pictures taken June 28th, 1952: (10) Dryer foundations in mill." Photograph depicts 9 men working on building speculated to be foundation for diesel engine. (See also items 2000.1.1.2.216 and 2000.1.1.2.217). Photograph depicts 4 men working on building speculated to be foundation for diesel engine. Oil tanks and mountains in background. Photograph depicts 7 men working on building speculated to be foundation for diesel engine. Oil tanks and mountains in background. Photograph depicts early stages of building believed to be mill, piles of building supplies in foreground. 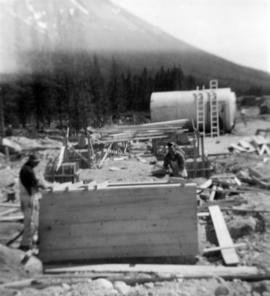 Photograph depicts early stages of building believed to be mill, mountains in background. 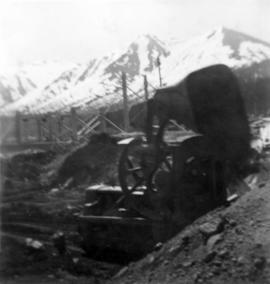 Photograph depicts track loader moving dirt, mountains in background. Corresponding note on accompanying photo description page: "4. Excavating for ore haul truck dump with mill in background. Looking southeast."